The course offers an authentic, professionally focused and practice-based education program with two sessions of internship (normally paid) in a real workplace setting. A number of the areas of study are available with explicit specialisations. For example, Civil Engineering is available with specialisations in Structures and Construction. Students can also focus on or broaden their studies by completing electives. By appropriate choice of electives, students can gain knowledge in a second engineering discipline, obtain a sub-major in a different field or study postgraduate-level subjects and apply for credit towards an engineering master's degree. The concept has been strongly endorsed in wide-ranging industry consultations. Interaction between work experience and academic curriculum is very strong, giving the program a depth that no other full-time academic course can match. The course aims to equip graduates with the skills and attributes needed for professional practice and leadership. It is based on the themes of academic development, personal development and professional formation. It provides sound foundations in engineering theory, technical expertise and knowledge of professional practice, while also developing academic literacy, advocacy skills and social awareness so that graduates become lifelong learners and effective citizens in many different capacities. Non-current school leavers are advised to complete the employment question on their UAC application and provide supporting statements of employment to UAC, as adjustment factors may be applied on the basis of relevant work experience. Entry to individual engineering majors is subject to ATAR requirements. Applicants who successfully complete a recognised pathway program are eligible to apply. Successful completion of the UTS Insearch Diploma of Engineering with no more than two subject failures guarantees admission to the Bachelor of Engineering (Honours) Diploma in Professional Engineering Practice with up to 48 credit points of recognition of prior learning. Full-time students normally complete the program in five years, which includes four years of study plus two periods of engineering internship in the workplace totalling at least 48 weeks. The internship is typically taken in the third or fourth session and again in the seventh or eighth session. It is possible to complete the program entirely on a part-time basis, with continuous concurrent employment, by enrolling at half the full-time rate; however, this is not recommended. Students wishing to make extensive use of part-time attendance are strongly encouraged to negotiate with their employers for at least two full-time sessions of study somewhere through the program. electives (within this component students may undertake a faculty-approved sub-major totalling 24 credit points): 24 credit points. 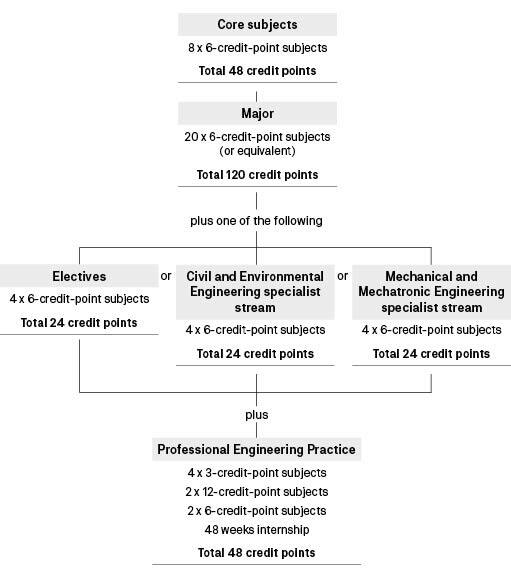 Students in the Civil Engineering major, Structures stream are recommended to complete 12 credit points of electives from approved postgraduate structural engineering subjects. Students in the Civil and Environmental Engineering and Mechanical and Mechatronic Engineering majors are required to select the specialist stream in their major in place of the electives. The major is selected at the time of application to the course; however, it is possible to apply to change major at a later date. Students admitted to the flexible major should decide by the end of the first year of full-time study to transfer to another major or continue with the flexible program. The Diploma in Professional Engineering Practice is not offered separately. The Diploma in Professional Engineering Practice requires the completion of two six-month internships and the Professional Engineering Practice Program. Completing 12 months of relevant engineering experience before graduating enables students to link learning in the workplace and learning at university, with each experience enhancing the other. Commencing students are required to complete the mathematics readiness survey to determine the most appropriate first-year mathematics subject to undertake. The Bachelor of Engineering (Honours) Diploma in Professional Engineering Practice may be awarded with first or second class honours, which does not require an additional honours year. International students in this course may transfer to the Bachelor of Engineering (Honours) (C09066).